This particular snack, sold in cellophane bags at traditional markets, is my after-dinner snack downfall. 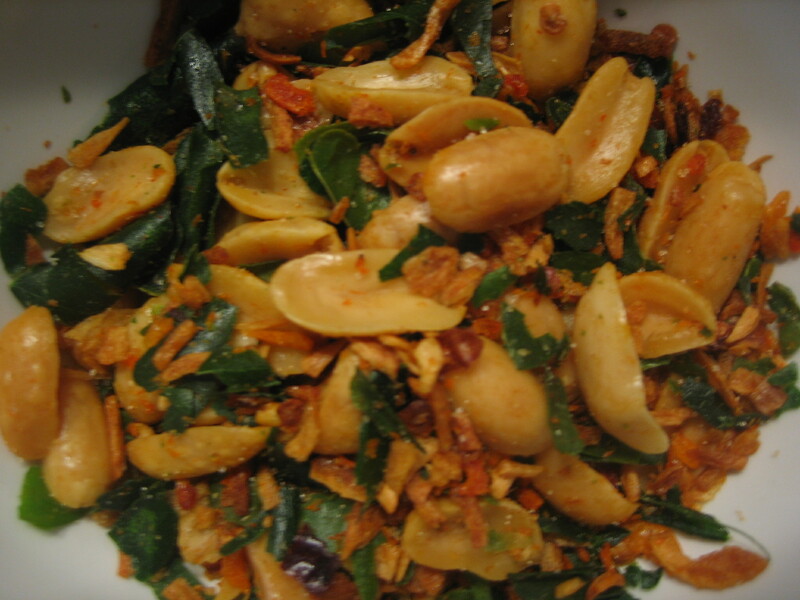 The peanuts are fried with kaffir lime leaves, dried hot peppers, and shallots, and are seasoned with salt, sugar, and the slightest hint of fish sauce. The lime leaves, the texture of stiff shiny paper, give the peanuts an almost medicinal astringency that’s balanced out by the crispy shallot slivers. The peppers are hot, and, while I eat them happily, Camilla (who shares my salt tooth) picks them out delicately. 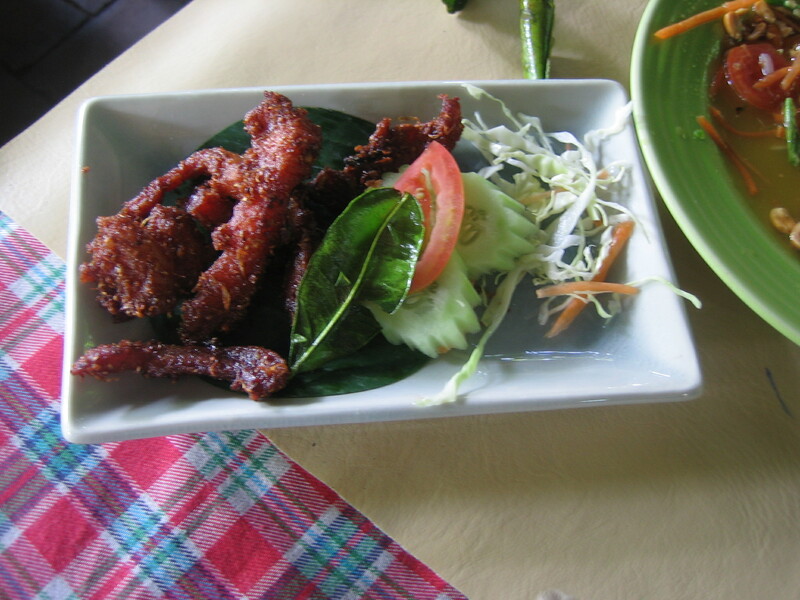 Muu Daad-Diao is an Esarn dish (out of rural Northeast Thailand) of strips of fatty pork that’s marinated, dried in the sun for a day or so, and then deep-fried. It’s chewy, savory, and absolutely delicious. The fattier the pork, the better; this particular plate, from an outstanding Esarn restaurant near Ram Hospital, bore strips of solid fat. Sometimes it comes with a sweet red dipping sauce, but I think that’s gilding the lily. I have already written of our affection for Pi Aeh and the khao soi ladies on Interwararot Road, their devotion to Ken and to Ascher, and our love of their version of this dish, traditional to Chiang Mai. For new readers, khao soi is a Burmese-derived chicken curry served over a mix of fresh and deep-fried crispy egg noodles and served with a plate of pickled shallots and vinegar. But this featured bowl comes from เสมอใจ (thanks, Ken, that would be Samoe Jai to non-Thai readers), a restaurant near our house. I feel like I have taken a mistress. Here, they serve khao soi muu—with slices of tender marinated pork instead of the usual leg of chicken—and the curry broth is spicier and tangier than Pi Aeh’s, and the pickled vegetables are stronger. It’s just as unctuous–note the drizzling of coconut cream over it all—but it’s more like a pork soup with noodles, rather than Pi Aeh’s magnificent pile of noodles, adorned with chicken and sitting in a small pool of broth. But at Pi Aeh’s, I rarely bother to drink up the broth; it’s good, it’s just not that good. At Samoe Jai, after I’ve eaten the noodles, pork, and vegetables out of the broth, I scrape up every last bit of the broth with my stainless steel spoon, admire how its hot spiciness is eroding their plastic bowls, and feel that the world is a wonderful place for the rest of the afternoon. I am in love. 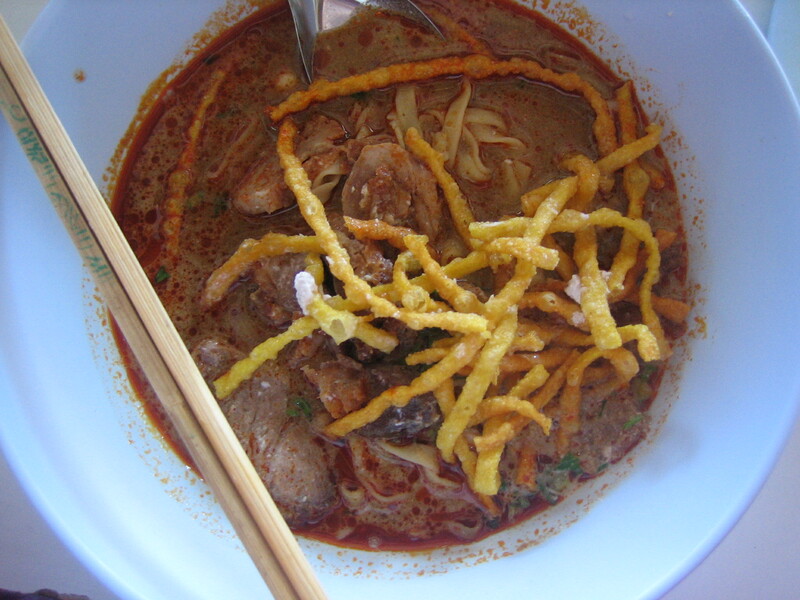 One bowl is not any more authentic than another: khao soi is by definition a fusion dish, and anything truly Shan (the part of Burma from which khao soi would have migrated to Thailand, via Yunnanese traders) wouldn’t have that much coconut milk in it anyway. The Yunnanese traders would have been Muslim, and nothing would have contained pork. So I dispense with the question of authenticity, and simply say that Samoe Jai’s khao soi muu is under my skin in the worst way. Whenever I can, I convince Ken to sneak off down the road there, and we bring the kids back to Pi Aeh on the weekends in a display of ostensible fidelity. Ascher always devours two plates of her delicious kam mon gai taawt (a fried fillet of chicken over a specially-dressed rice), which goes a long way towards assuaging my khao soi guilt. My love affair with Samoe Jai is deepened by their other great specialty: pork satay. 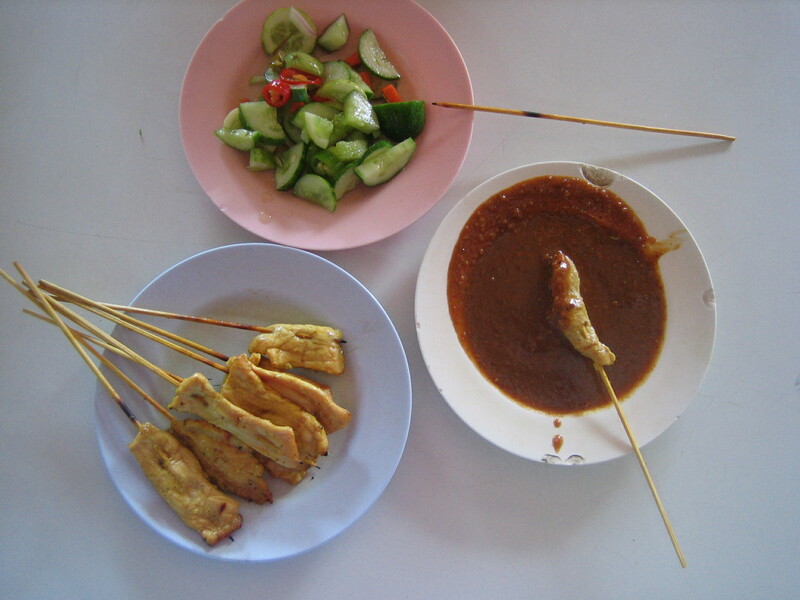 Many of you know chicken satay from Thai restaurants, and it’s a perfectly acceptable dish. But Chiang Mai cooks, especially those at Samoe Jai, have a magic way with pig. These slices of pork, tender beyond belief, are marinated in one creamy sauce, grilled on the street over tiny charcoal braziers just until done, and then served with a different peanut sauce. In this final sauce, the peanuts are roasted, and then ground not into the usual paste, but only until they are fine enough to be incorporated into the sauce. The extra step of roasting them results in a deeper, sweeter, richer sauce than what one friend called the “warmed-over Skippy” you get in American Thai restaurants. The traditional accompanying dish of a cucumber salad is chopped more coarsely than you see even here, and sometimes it sports slices of carrots as well as hot red and green peppers, for additional prettiness and sweetness. As if that weren’t enough, the sweet shop next to Samoe Jai—beautifully positioned for all those people finishing their savory, spicy meals, and completely vulnerable to mango leather, steamed rice cakes, and various other kanom—sells these cookies, which I’ve never seen anywhere else. Cigar-style cookies are very common here. The kids are wild about the ten-baht packet of sweet-paste-filled, violently-colored “swizzle sticks” Ken buys at the market. But I’d never seen this version until I spotted them on the shelf, sold at the exorbitant price (for kanom) of fifteen baht for a much smaller bag. I asked the vendor, “Aroi may?” (Are these good to eat?) He looked at me like I was an idiot, and said firmly, “Aroi.” And he was so right. 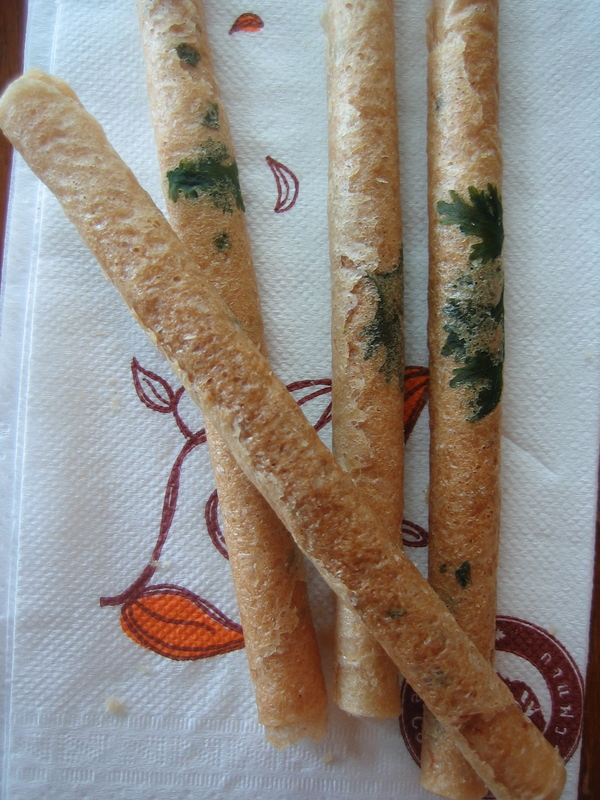 They are swizzle sticks for adults. Rolled from a palm-oil and palm-sugar dough, they crunch down to a sweet fragile nothingness on the tongue. The cilantro gives the cookie the slightest vegetal depth. It could be there for nothing but sheer beauty. I wouldn’t care at all. I just want another bag. Lastly, a long-standing favorite, dating back to my pregnancy. Kasem is a Thai-Chinese business of two stores, one out at our old neighborhood off of Nimmenhemin Road, and one in Chinatown near where we live now. They provide to the ex-pat community all the Western groceries they can cram into their tiny shops: Hershey’s baking chocolate, passable coffee, Kraft mayo, cheese, bread, olives, organic vegetables from the Royal Project, spaghetti sauce, peanut butter, and baked goods. I was a regular in their Nimmenhemin shop during my pregnancy. Eight years later, we walked into their Chinatown shop with two children, and the proprietress greeted us with an enthusiastic wai and asked “Where have you been? It’s been a while since I’ve seen you. You used to be pregnant.” You’d think we’d gone out of town for a few weeks. Now that I’m a regular again, the grandmother-matriarch of the business insists on trying to teach me advanced phrases and nuanced distinctions in Thai, as if I had any idea of what she is saying to me, and then rewards my patience with slices of banana cake. It’s the coconut rolls, however, that I’m after. Built like a good cinnamon roll, they are as tender and chewy as that template. 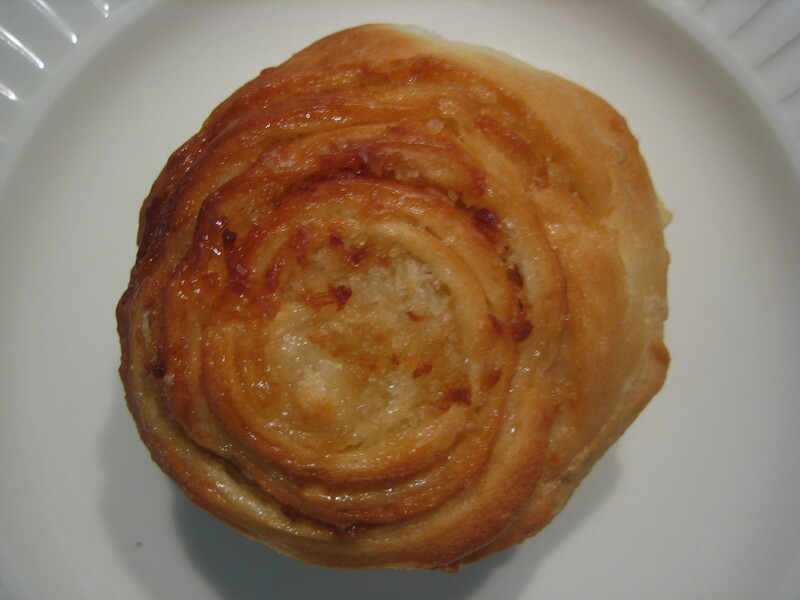 But Kasem’s signature treat is stuffed with a sweet filling of freshly shredded coconut that meets your bite through the roll with a slightly crunchy resistance. Paired with a morning cup of coffee, they are of course divine, but somehow, they take on a particular richness in the afternoon, when the sun has warmed them through my shoulder bag and they’ve steamed ever so slightly in their cellophane wrapper. Ascher requested them for his classroom birthday party, and I am the best Mommy in the world whenever they show up as an after-school snack. The after-school snack scene is in itself a subject for another entry. The Thais are world-class snackers, and nothing compares to the bounty of fried, sweet, icy, caloric, sticky, and salty treats they peddle to their beloved children. You’ve got to come up with a recipe for that coconut roll – sounds divine. To celebrate my birthday, I took the kids for teppanyaki and had fried coconut ice cream for dessert (needed something for the candle!) but it was middling, at best.